The discourse on religious extremism in the past few decades has largely been dominated by Islamist-oriented trends and actors. However, there are emerging alternate discourses of religious extremism that are becoming relevant in South and Southeast Asia – Buddhist and Hindu extremism. 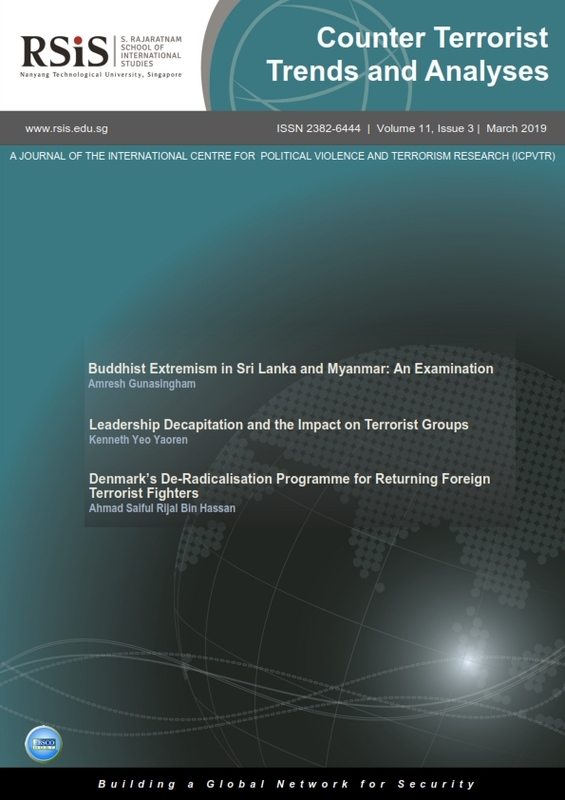 The March Issue thus focuses on Sri Lanka and Myanmar as case studies depicting the rise of Buddhist extremism and related intolerance towards the minority Muslim communities. The Issue also delves into two different responses to counter-terrorism by the state and community stakeholders in their bid to tackle religious-motivated terrorist groups. It takes a look at two divergent ‘hard’ and ‘soft’ counter-terrorism responses: (i) leadership decapitation; and (ii) the Danish de-radicalisation programme. First, Amresh Gunasingham narrows in on radical Buddhism in Sri Lanka and Myanmar focusing on the rise of the Bodu Bolu Sena (BBS) and Ma Ba Tha groups respectively. The author argues that these groups, rooted in Theravada Buddhism, have justified intolerance and violence towards minority Muslim populations that could escalate further, if neglected or exploited by the state. In Sri Lanka, periodic attacks against Muslims since 2014 and the legitimacy of groups such as BBS have emboldened a segment of the Sinhalese Buddhists. In Myanmar, the violent clashes between the Buddhist majority and the Rohingya, minority Muslim community since 2012, coupled with Ma Ba Tha’s rhetoric bordering on Islamophobia, have exacerbated intolerant ethno-nationalist sentiments within the country. The author proposes the need for a national identity that is inclusive and peaceful in both countries with political leaders taking a stand against intolerant narratives to mitigate long-term unrest. Kenneth Yeo Yaoren discusses leadership decapitation as a counter-terrorism strategy, which includes killing or arresting the senior leadership of a terrorist group. The author outlines the varying outcomes of the strategy in the context of religiously-motivated terrorist groups in the Israel-Palestine and Malay Archipelago regions. The impact of leadership decapitation on four key groups: Hamas, Hezbollah, Abu Sayyaf Group and Jemaah Islamiyah in terms of the frequency and lethality of attacks after the arrests or killings of their leaders are observed. It is argued that, “leadership decapitation is not a silver bullet against terrorism”, necessitating broader responses to counter the ideology and operational strength of religiously-motivated terrorist groups. Lastly, Ahmad Saiful Rijal Bin Hassan focuses on Denmark’s de-radicalisation programme in light of the returning foreign terrorist fighters (FTF) phenomenon. The author delineates the components and key features of the ‘De-radicalisation – Targeted Intervention’ and the ‘De-radicalisation Back on Track’ projects which constitute a ‘soft’ approach towards dealing with homegrown terrorists and FTFs in the country. Overall, three guiding principles dictate Denmark’s de-radicalisation programme – (i) inclusion over exclusion; (ii) collaboration between public, private and people sector bodies; and (iii) assumption that every individual aspires to live a ‘good life’. The article then focuses on the perceived efficacy of the programme in the Danish context vis-a-vis contending views made by other interested observers.